Patrick Bartscherer (left), Eric Hillegass, and Griffin. Credit: Matt Skoufalos. Patrick Bartscherer and Eric Hillegass will appear on the April 2 edition of the show. Their home goods store, Bespoke Home + Life, is planned for the summer of 2019. Patrick Bartscherer (left) and Eric Hillegass in their Collingswood home. Credit: Matt Skoufalos. 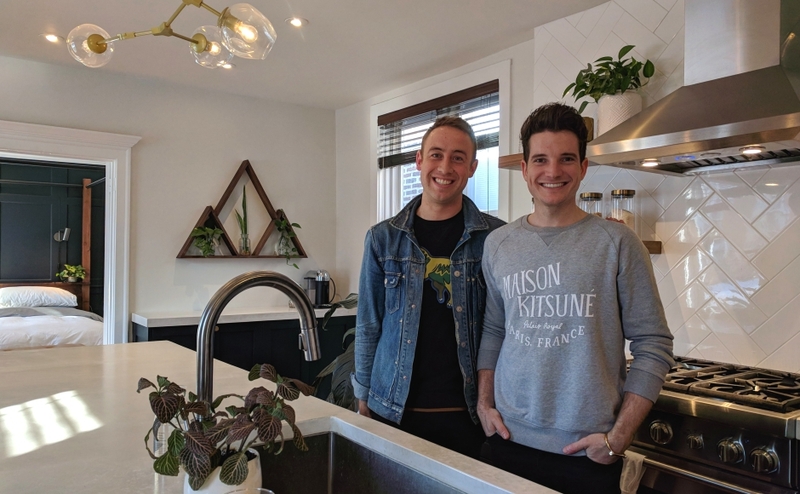 When Eric Hillegass and Patrick Bartscherer show off their new Collingswood home on House Hunters next week, it will be their third time on the program. Their first appearance came in 2013, in which the couple sniffed out a Philadelphia loft at 13th and Callowhill with the help of Hillegass’ mother, Kim, a realtor from Tamaqua, Pennsylvania. They overhauled the space themselves, adding a second loft suite within a year—just when producers returned for a follow-up episode. And a week after it was filmed, the couple moved out. A writer-producer for Sprout children’s television, Hillegass was transferred to its New York headquarters when the network became Universal Kids. Thankfully, the improvements they’d made to the loft helped springboard them into a fifth-floor walk-up in Hell’s Kitchen. Five years later, however, it was time for another change. 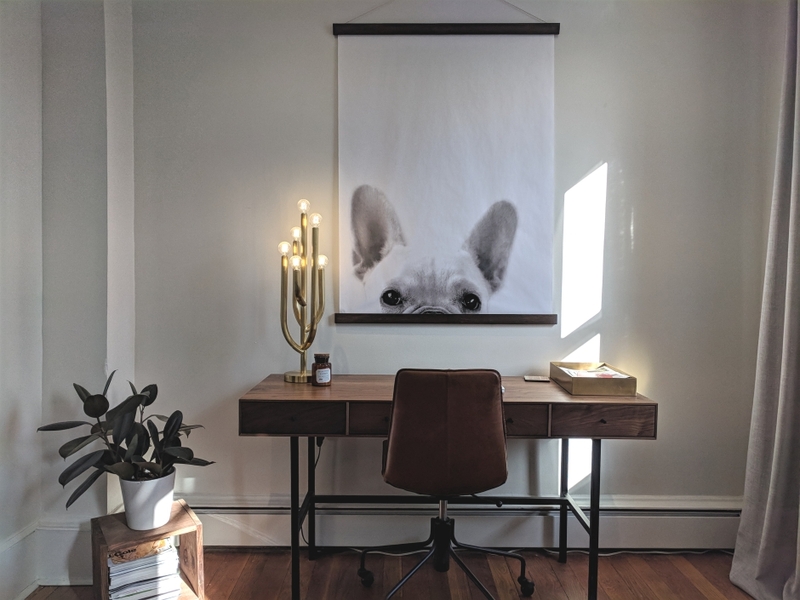 Bartscherer and Hillegass’ Collingswood home is full of the same bespoke touches their home goods business will emphasize. Credit: Matt Skoufalos. The couple didn’t know what would be next, but they wanted to build a home that would also serve as a base of operations for their project. New York real estate was prohibitively expensive for their vision, and the couple, who’d met at Drexel University, missed the Philadelphia area. The Pennsylvania suburbs felt too disconnected from the pace of the city, so they started searching for mixed-use properties in South Jersey. Bartscherer, who works on the visual design team for clothier South Moon Under, was excited to search in towns along the PATCO Speedline, which would facilitate his commute. Bespoke Home + Life will feature handmade planters and plant propagation stations, like these Hillegass created in his Collingswood home. Credit: Matt Skoufalos. When they landed in Collingswood, Bartscherer and Hillegass fell in love with the former Yogawood studio at 817 Haddon Avenue. 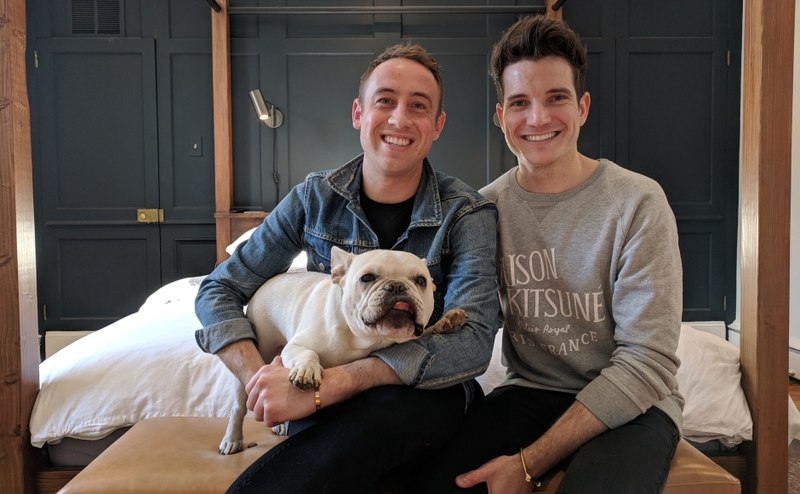 It ticked all their boxes: an off-street parking space, a yard for their French bulldog, Griffin, and a downstairs commercial unit in which to launch their home goods start-up, Bespoke Home + Life. The business is still under construction, headed for a summer 2019 launch. 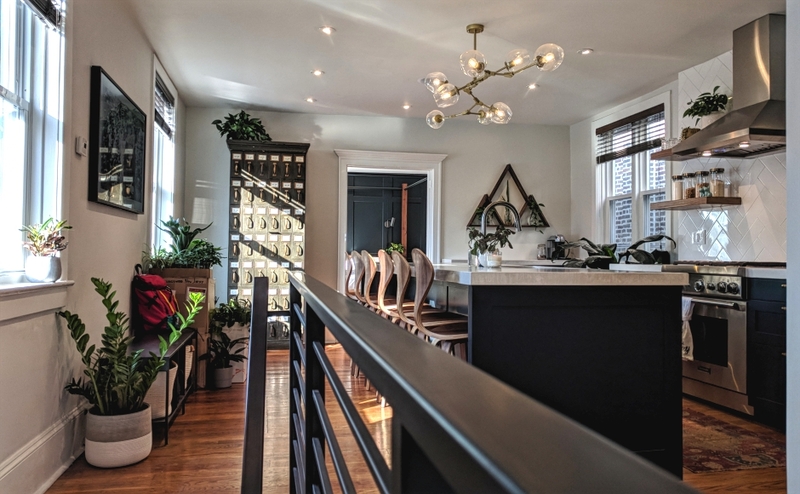 In the meantime, the couple has fully redone the apartment above, leveraging all the skills honed in the time since their first HGTV appearance. 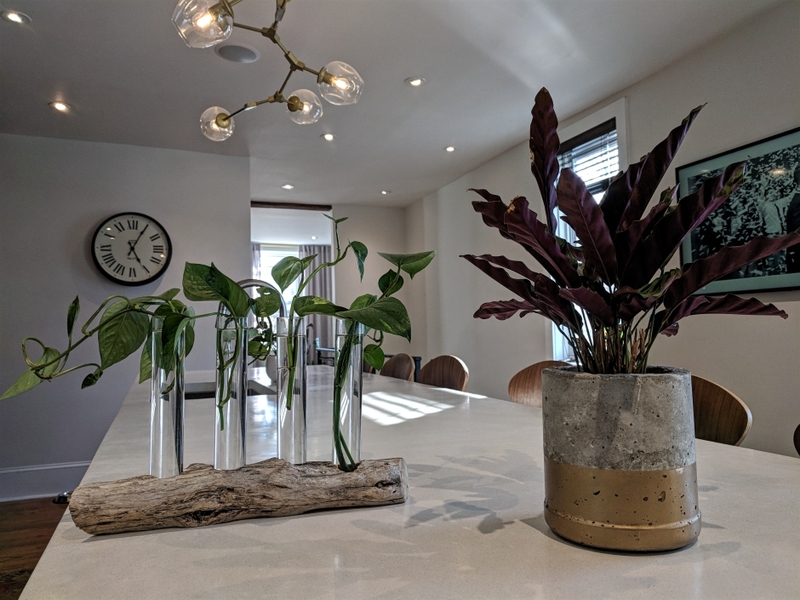 “What fueled the interest in having a home décor and plant store in the first place is having done it and having done it ourselves,” Hillegass said. “We learned a lot when we renovated the loft in Philly, when we were renovating our place in New York. Griffin makes an appearance on Bartscherer and Hillegass’ wall tapestry. Credit: Matt Skoufalos. Bespoke will focus on handmade home goods, including the plant propagation stations and concrete planters Hillegass makes in his first-floor workshop. He hopes to emphasize this aesthetic in make-and-take classes, supplementing that inventory with other products from small vendors across the country. “And then lots of plants,” he said, the more exotic among them originating in nurseries and greenhouses from Florida to Canada.